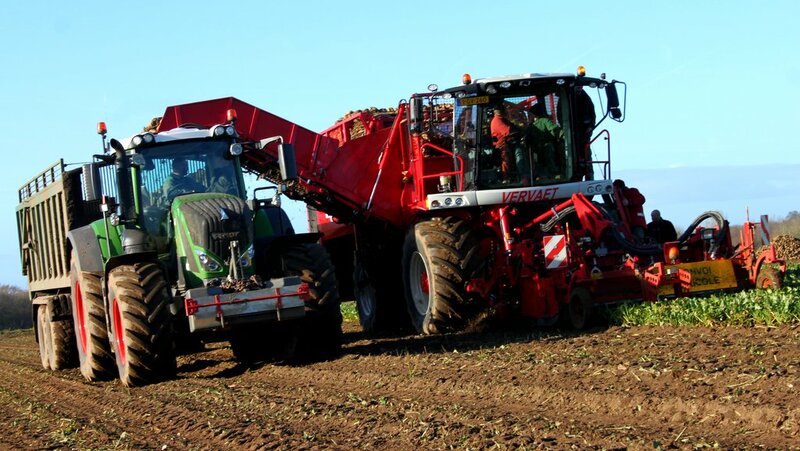 Claimed to be the UK’s most popular sugar beet harvester model, the Vervaet Beet Eater 617 is being replaced by the new Q-series design. Martin Rickatson reports from its UK launch. 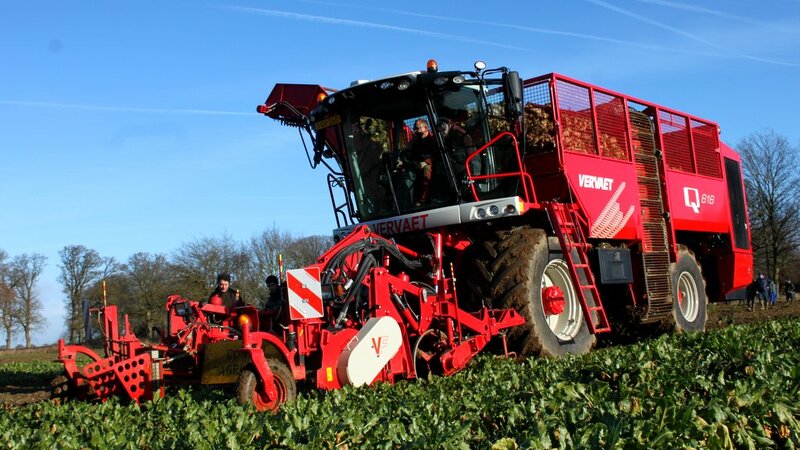 Vervaet has replaced its popular 617 beet harvester with two models which feature a new design with centrally-mounted rear wheels. 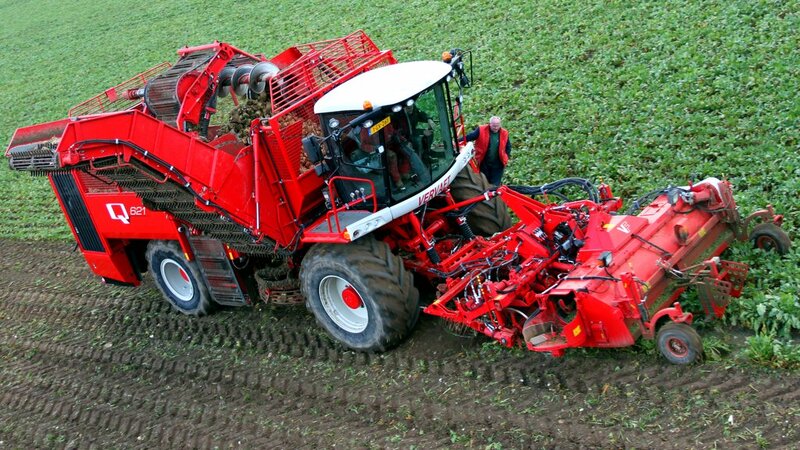 Dutch self-propelled beet harvester manufacturer Vervaet has completely revamped the design of its best-selling machine, the Beet Eater 617 six-row model, changing its layout to create a more compact and manoeuvrable unit capable of higher outputs. 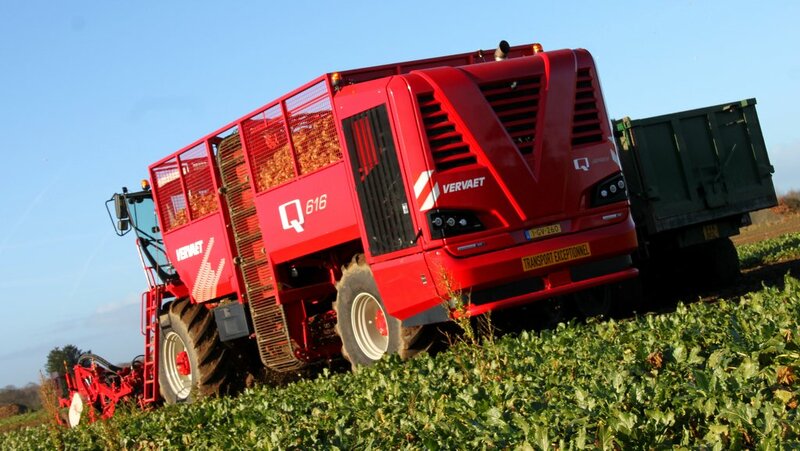 Making its debut at an open day held in Norfolk by importer J Riley Beet Harvesters (UK), a modular design allows two variants of the new Q-series machine, the Q-616 and Q-621. Key specification differences include a 465hp engine and 16 tonne tank capacity for the smaller machine, and 510hp and 21t for the larger. In addition, the Q-616 uses a fixed ring elevator, while the Q-621 has a tiltable ring elevator and hopper side extensions. Vervaet says the one tonne reduction in tank capacity but faster unloading capability means the Q-616 offers similar output to a 617 but is lighter and has an improved weight distribution, suiting those operating on difficult soils and with particular concerns about compaction. The Q-621, meanwhile, is designed to offer a significant output jump over the 617. For both machines, manoeuvrability and weight distribution have been further improved by altering engine layout. Where previously the six-cylinder DAF powerplants were mounted between the rear wheels, they now sit crossways at the rear of the machines. J Riley says the new machines are available for immediate order for delivery in time for the 2017-18 beet campaign. Prices are to be confirmed. The biggest change is a move away from the conventional four-wheel format favoured on the 617 to a layout similar to that on Vervaet’s larger 625. This sees twin rear wheels centre-mounted as a pair and steered in turntable fashion, resulting in the machine’s weight being distributed across its full working width for even soil consolidation. When combined with an eight-degree front wheel steering capability, this reduces inside turning radius to 2.4m. For those who prefer the conventional rear axle format, this remains on the options list. A 40km/hr top speed capability in place of the standard 30km/hr can now be specified for the first time, and on machines equipped with this option a four-wheel braking system will be fitted. Front axle options include Zuidberg tracks – for which, unlike on the 617, there is no need for a different harvesting configuration – or 710 R42, 800 R38 or 900 R38 tyres. At the rear there are 800, 900, 1,000 or 1,050mm tyre choices, all mounted on 32in rims. Depending on the rubber specified, tyres can be run at pressures as low as 1.0 bar. Manual side-hill levelling is standard, with an automatic system optional. Another major change is to unloading elevator design and location. While the 617 used a wide centre-mounted unit, the Q-series design sees the elevator move to the front end of the tank. While it is 30cm narrower than the previous unit, it has been extended for greater reach and higher piling, and to enable easy filling of higher-sided trailers. Its easier-to-aim design and higher unloading speed are also said to boost emptying times, while the relocation improves visibility and lowers the harvester’s centre of gravity. The machine’s levelling system also adds 50cm of movement either way to the discharge height, making direct unloading possible into lorries and high-sided chasers, and the creation of higher, shorter windrows for processing by self-propelled cleaner loaders. At the front of the new machines, topper choice remains unchanged, comprising an integral unit which leaves chopped material between the rows, or a combi topper which provides the choice of distribution to the rear or the side of the unit. Behind the share or Oppel wheel lifting units, cleaning options offered alongside the standard six-turbine fitment include a new five-unit option, for lighter soils where less soil adheres to the beet. Turbine diameter has been increased by eight per cent to improve crop throughput.